There is a lot of talk in the news about global climate change, which is long-term change in the earth's climate. Whether or not you agree with the causes for these changes, models and analyses continue to predict hotter, drier weather with more severe storm events and accelerating sea level rise in our part of the world. 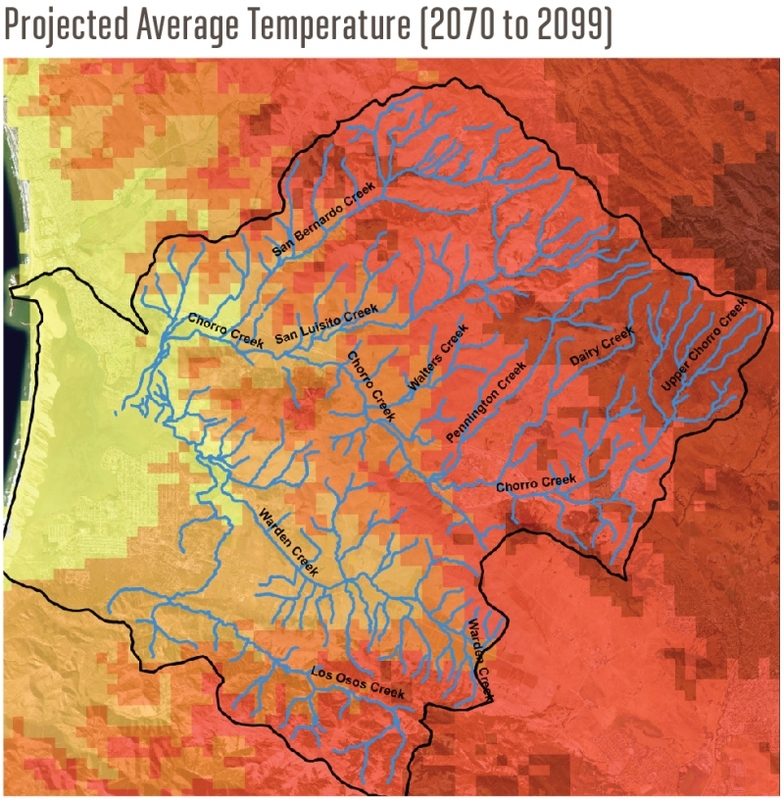 The map on the left shows historic average high temperatures from a 30-year period, while the map on the right shows the projected average temperatures at the end of this century and into the next. 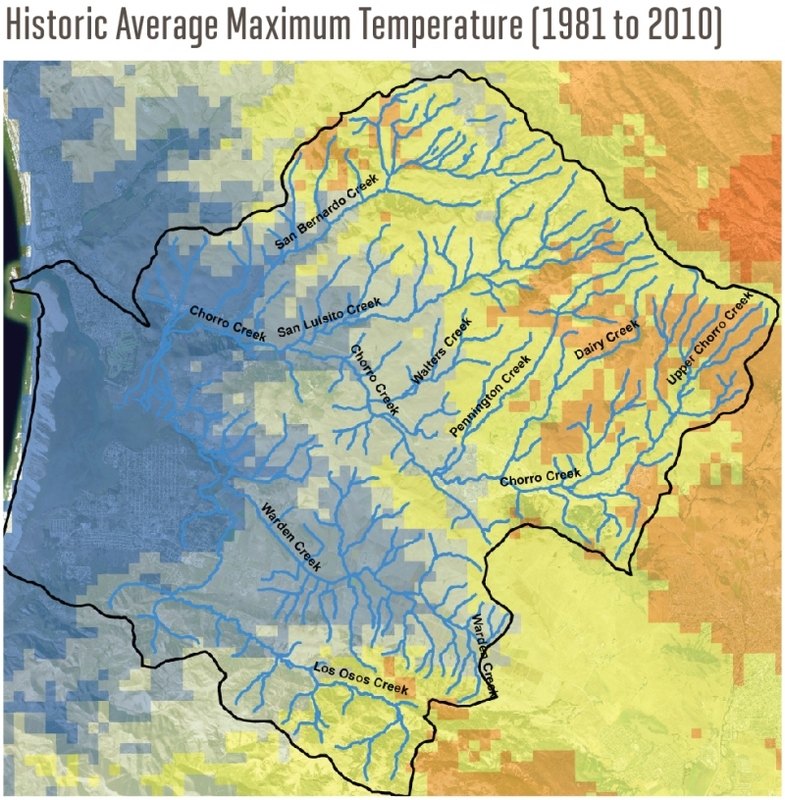 Models predict a temperature increase of at least 3.6 degrees F in the city of Morro Bay and the estuary. Morro Rock could once again become an island, and the protective jetties and causeway (land connecting Morro Rock to the shore) would be lost. This infrastructure ensures safe entrance into Morro Bay, which was historically known as a teacherous harbor prior to the construction of these structures. Although Morro Bay's power plant is now shuttered, plans are underway to incorporate the facility into a new off-shore wind energy project. Its current location puts it in danger from sea level rise. Similarly, the wastewater treatment plan that services Morro Bay would also be threatened with inundation. Morro Bay's Embarcadero is home to many shops and restaurants popular with tourists, as well as a working waterfront that supports a thriving commercial fishing industry. Sea level rise would inundate the waterfront, resulting in impacts to both the tourism and fishing industries. State Park Marina is a popular spot for boats as well as kayaking. Rising seas would also inundate a portion of the State Park golf course and sensitive marsh habitats. Forested portions of State Parks would be more susceptible to wildfire due to drier and warmer conditions. Bay waters will push their way up Chorro Creek, inundating areas with salt water that currently only contain freshwater. Both air and water temperatures are expected to increase. These changes affect the habitat for fish and other wildlife, including the endangered steelhead. Additionally, South Bay Boulevard, the only road directly connecting Los Osos and Morro Bay, would be lost. The habitat of the salt marsh area would shift dramatically with rising water levels. The area will shift from marsh habitat to mudflat, and wildlife will have to shift accordingly. Rising bay waters will push salt water further up Los Osos Creek, altering the habitat for wildlife, including the endangered tidewater goby. The community of Los Osos has homes built right up to the bay edge. Some of the low elevation neighborhoods would be inundated, forcing hundreds of people to relocate to higher ground. Bigger storms with increased storm surge could also damage homes in low-lying areas. The Sandspit that protects the bay waters from ocean waves would shrink. In some locations, ocean waters might overtop the Sandspit, changing circulation patterns in the bay. This map shows the current sea level in Morro Bay. However, with a predicted increase of 3.6 degrees F by the year 2100, sea levels will continue to rise. Click the points on the map to see the expected impacts to the infrastructure, habitats, and wildlife that call Morro Bay Home. The examples in this map assume that we strictly control greenhouse gas emissions, resulting in 16.5 feet of global sea level rise. The actual amount of sea level rise will depend on the level of carbon we continue to emit. 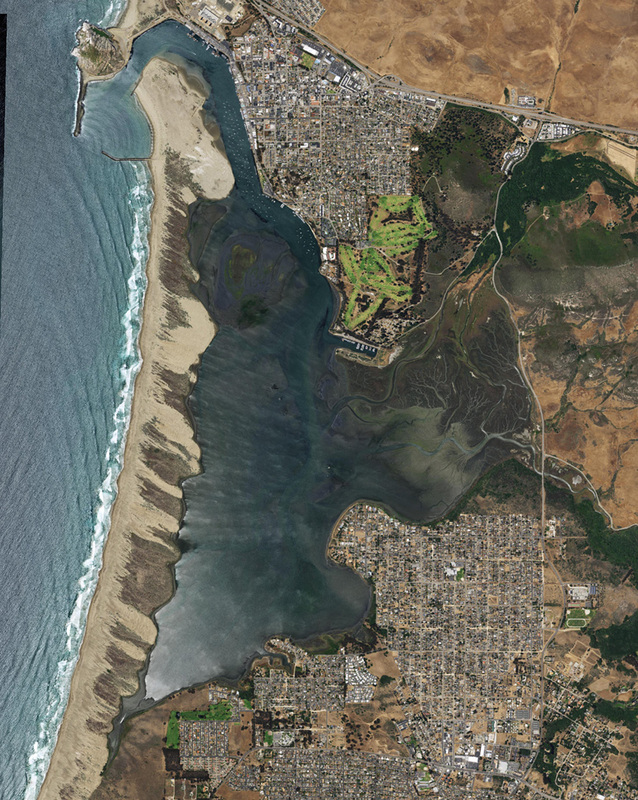 Click on the points on the map to see the different impacts to the infrastructure, habitats, people, and wildlife that call Morro Bay home. Even little actions can make a difference. Reduce energy use at home by switching to compact fluorescent light bulbs and reducing use of your heating and cooling systems. Recycle. It takes 20 times the energy to make an aluminum can from scratch as compared to making a can from recycled aluminum. Reduce your driving by carpooling or using public transportation. When you drive, reduce the amount of time you idle, and don't accelerate and brake hard so that you can improve your fuel efficiency.